Paddy McGrath of Donegal in action against Declan McCusker of Fermanagh during the Ulster GAA Football Senior Championship Final match between Donegal and Fermanagh. Tomás Ó Sé says the likes of Fermanagh and Carlow will have to 'go back to the drawing board' if they are to continue their development as teams are learning how to deal with their defensive style. 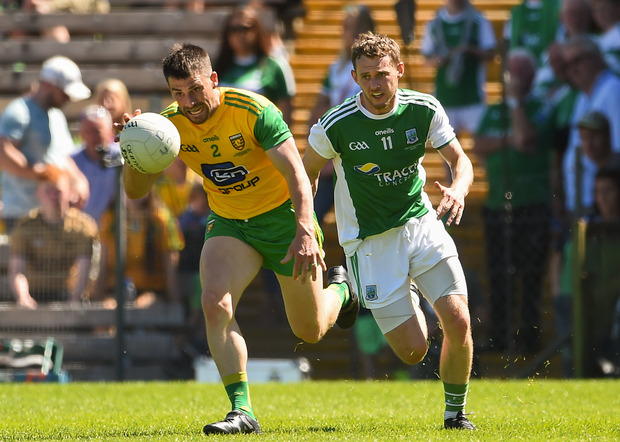 Donegal ended Fermanagh's hopes of winning a first-ever Ulster football championship with a comprehensive 12-point win in Clones on Sunday. Fermanagh unexpectedly made the final after upset wins over Armagh and Monaghan, while Carlow also surprised many in Leinster with a shock defeat of Kildare in the quarter-final before a semi-final loss to Laois at Croke Park. Ó Sé said the defeat of these largely defensive-minded teams shows that sides have figured out how to approach that style of football, and suggests the likes of Fermanagh and Carlow will have to adapt if they want to survive. "What I think is happening is an actual revolution in terms of changing this defensive style," Ó Sé told The Throw-In, Independent.ie's GAA podcast. "Everyone was playing a defensive system and I understand totally why with the Carlow's of this world and Fermanagh's of this world, and it'll bring you so far. It will get you out of your league and it will get you maybe the odd big win over a team. "But the reality is you're going nowhere long term unless you can knock on the scoreboard. And I'm afraid that's where Carlow and Fermanagh will have to go back to the drawing board. They have a foundation there of good defence, but they need to be able to score, they need a plan better than what they're doing. "What's happening is teams are learning to defend against their counter-running. As the Laois's beat Carlow, as the Donegal's beat Fermanagh, you will find that teams outside the top table will also find ways to beat this mass defence. "I'm not saying every team can do what a Kerry can do, or every team can do what a Dublin can do, they can't, but Laois wouldn't have the firepower that Kerry have and they found a way around the defensive style of football."